wedding hair. We even provide fun birthday packages for children, and all you have to do is provide the cake! Weddings, proms, and parties cost enough without you having to pay a fortune for your hair too. Your wedding dress should be complemented with the perfect hairstyle. During your consultation, you can show us images or concepts of the look that you want to go for and our professionals offer you helpful advice and guidance. We assemble the package to suit your look on the day. Your trial hairstyle is arranged before your wedding day so that you are completely happy with the end result. If you book well in advance, we can offer a mobile option where we come to you. Our team can travel to your location and provide hair styling for the bridesmaids, mother of the bride, and the groom’s mother. together with our prom package. for more information and to discuss your requirements and availability. This is perfect for your younger one’s birthday. Our friendly team create beautiful curls in their hair as well as offering a mini facial, manicure, and pedicure. We also provide a buffet, squash, and a gift for the birthday girl or boy. The duration of the event can be two or more hours and all you have to do is bring the cake. From £20 to £30 per child, we have unique packages so make sure that you get in touch for price specifications. All packages may be altered if needed on booking. An adult of the party must be present at all times. Soft drinks and buffet will be supplied and cake must be supplied by parent or guardian. 40% deposit applies when booking the party, the remaining can be paid on the day. We recommend that the party is booked in at least two months’ notice. Please enquire within the salon or via the salon contact number 0117 9869365. 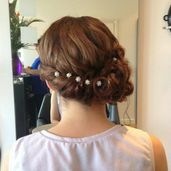 Contact us in in Keynsham, Bristol, to learn more about our beauty packages including wedding hair.